Carmel High School’s German classes got a history and art lesson combined with a German visitor. 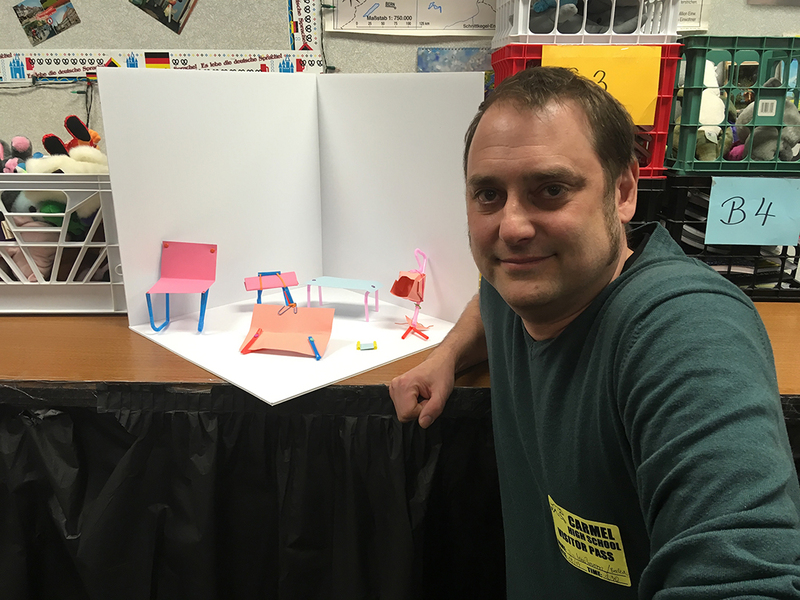 Dirk von Manteuffel, a product designer from Germany, held a workshop at Carmel High School March 18. He is in the United States for two months for the Discover Bauhaus Tour, which is part of the Deutschlandjahr USA, Year of German-American Friendship. It is funded by the German Federal Foreign Office, implemented by Goethe-Institut and supported by the Federation of German Industries (BDI). Bauhaus was a German art school from 1919 to 1933 that combined crafts and fine arts. It was pressured to close by the Nazi regime. Many Bauhaus instructors left Germany and founded a new school in Chicago. German teacher Angelika Becker said von Manteuffel challenged students to make a chair design with minimal art supplies. Senior Ellie Thompson said the presentation was interesting. “We’ve been learning about it for the past week about the different art styles, and we learned about it in the context of the early 20th century, so it was really interesting to see how it is still apparent today,” she said. Thompson, a member of AP German V class, said it was nice to have someone talk to the class instead of watching a video on the topic. Thompson said groups of three to four students took a 10-minute challenge with straws, paper clips, paper fasteners, index cards and rubber bands to make a chair in the Bauhaus design. “It was much more hands-on than some of the history we get to learn about,” Thompson said.